Createspace Independent Publishing Platform, 9781514377659, 332pp. A raucous mix of double crosses, brothels, triple crosses, and cocktail recipes, Breakfast at Cannibal Joe's is a dark, twisted, and picaresque tale, a transgressive black comedy like no other. Joe Chambers is a CIA operative working in Dublin. Assigned to an agency-backed publishing house, his problems include, but are not limited to, errant MI6 agents, a Francoist dwarf, insane profit-making schemes, and a tapeworm named Steve. Utterly reprehensible, he is the perfect guide to this bizarre and repulsive journey into Dublin's gutters. Jay Spencer Green presents a twisted and exaggerated - but wholly recognizable - vision of a town where cat's cheese salad and a dubious pork/human hybrid meat share the menu, where mass canine culling is a hobby for the masses, and where clowns, chuggers, and carneys form the heart of the resistance. It is a Dublin of no redemption, a place where all bets are off.Breakfast at Cannibal Joe's was voted Best Indie Comedy of 2015 and was the winner of the 2015 Lord of the Book Covers award. Jay Spencer Green lives and works in Dublin, Ireland. 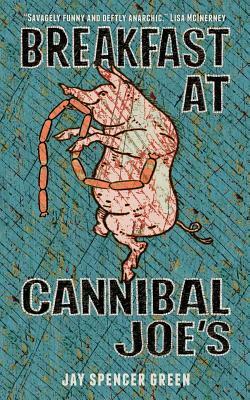 He is the author of five novels, the first of which, Breakfast at Cannibal Joe's, has been described as "Hilarious," "Horrific," "Scabrous," "Scatalogical," and "Savagely Funny." He has worked as a factory laborer, college lecturer, van driver, court coverer at Wimbledon, database editor, theater stagehand, hotel dishwasher, and conveyor belt overseer. Over the years, he has also launched a number of projectiles into space, usually in the direction of the TV.